It has been a little while since I posted about photography. Sadly I have been very busy and have not been able to update my photography website as often as I would like. That is not to say that I haven’t been taking photos – I have. I’ve been snapping away while I’ve been coaching at a junior world cup in Italy, as well as while I spectated at the European Championships for Short Track speed skating in nearby Malmø. Something that I have come to realize when reviewing my photos is that I generally only take photos at big events. I organize my photos into folders by month, but I could just as easily organize them into folders based on events. This struck me because it wasn’t always like this. My camera used to be attached to me at the hip (so much so that I usually carried bruises around my hips) and I would take photographs pretty much all the time. Most photographers like to think of themselves as intrepid photojournalists, ready to capture historic moments as they happen before their eyes. I’m no different, but lately I haven’t been carrying my camera around a lot. The reason for this is because it is very heavy. At the pointy-end of my setup is a Nikon D800 which sports a 24-70mm f/2.8 lens about 90% of the time. It takes amazing photos, but it is very heavy, and when I’m riding my bike around, running from meeting to meeting, and getting my skates on to do some coaching, it is simply too much of a burden to carry around all the time. Why don’t I use my phone? Phone cameras have come a long way, and the camera on my iPhone is actually very decent, but I have quite an eye for image quality, and the image sensor on a phone camera, no matter how many pixels it has, just doesn’t cut it. I used to carry around a Panasonic Lumix DMC-LX3 as a backup point-and-shoot. I still have it (and should probably sell it) but the technology is quite dated, and the images aren’t great. I get away with it because I am able to shoot in RAW format and so have a great deal of latitude for “scrubbing up” the photo in post-production, and this is the only way I can make the photos look decent.1 Recently however, the segment segment of the market known as “large sensor compacts” has grown and become more mature. Previously, these large sensor compacts fell into two rough categories – (1) those aimed at users upgrading from small point-and-shoot cameras who simply want to pay a little more, and tote around a slightly larger camera, in exchange for better image quality, or (2) those aimed at users who already own an SLR but who want a smaller camera which still retains a lot of manual control and of course, good image quality. Sadly, due to market forces, the former category got a lot more attention than the latter for the simple reason that there was a much greater demand. However, now that it has become very “hip” to be a photographer, the latter category is slowly gaining attention. In fact, the subject of my latest purchase, the Sony NEX-6 was only announced late last year and became available in November. I have been searching for a camera small enough to be pocketable (in large jacket pockets) yet still with good image quality for a while. Sensor technology continues to develop at an impressive rate, but ultimately the quality of the image comes down to the size of the image sensor. 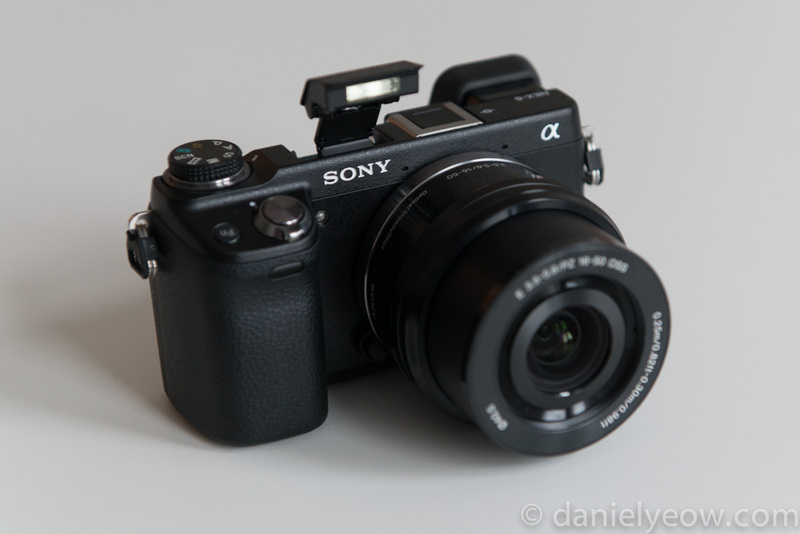 Most SLRs have what are called APS-C sized sensors, which measure 24x16mm and these are generally very good (I would call them “serious” image sensors). The next step up is “full frame” which is slowly become more widespread outside of the full-pro community of photographers. Those sensors measure 36x24mm and come with a few advantages (shallow depth-of-field, greater light-gathering capacity, higher dynamic range) but at a cost – cameras which carry full frame sensors are generally quite expensive. After that, you go into stratospherically-expensive territory with medium format (Mamiya, Leaf, PhaseOne, Hasselblad, Leica) cameras. Strangely, if you want to go smaller than APS-C, there is quite a jump until you hit the next widely-used sensor size (1/1.7″) which is about 7.6×5.7mm. Indeed, in many respects, this camera is the equal, if not superior to most current entry-level SLR cameras. It is certainly a better camera than my first digital SLR, both purely in terms of specification, but also in terms of the quality of photos it takes. It has an electronic viewfinder with a resolution of 2.3 million pixels (about twice the resolution of most rear-LCD displays). While electronic viewfinders aren’t as good as purely optical ones, the space saving value of having one is substantial (and most people won’t even know the difference). 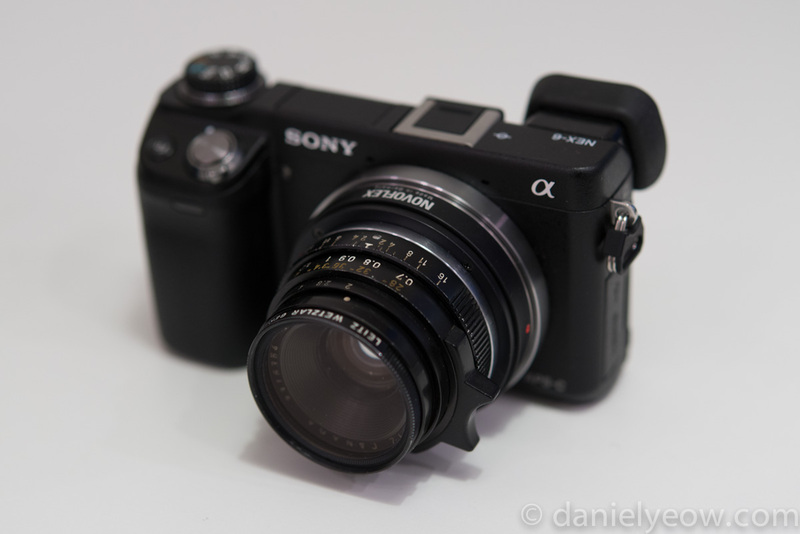 The one drawback to the NEX camera system overall is the lenses. In short, they aren’t great. There are a handful of high quality Zeiss fast prime lenses, but they are large and bulky and, for my purposes, defeat the point of having this camera. The “kit” lens, an impressively compact 16-50mm f/3.5-5.6 zoom is certainly a very practical choice, but the optical quality is lacking. Sony relies on in-camera software to compensate for the lens’s shortcomings, but since I process RAW files, the “cheapness” of the optical design is apparent. There is substantial distortion of the image field, as well as significant light falloff towards the corners. It is possible to correct these in post-production, but it is obviously not an ideal situation. Still, the focal range is very useful, and I feel that I’m probably going to spend a lot of time with this lens on the camera. However, fact that the Sony E-mount system doesn’t yet have a wide selection of high-quality compact lenses has not gone unnoticed in the photography community. With the help of a few lens-adapters, it is possible to fit almost any lens imaginable onto the camera body. Since you’re not going to find an interchangable-lens camera body with a high-quality APS-C lens in such a compact form factor in too many other camera systems, it seems an attractive proposition to put other lenses on this camera. 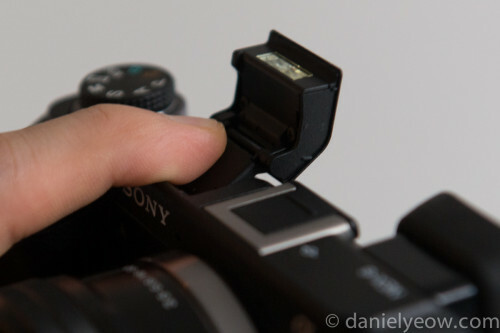 Obviously, with these third-party adapters, you lose the camera’s ability to control the lens’ aperture or focus, or even for the camera to identify what lens is being used. However, this isn’t a problem since enthusiastic photographers such as myself grew up with manual-focusing lenses and if a good example can be found, then the ultimate compact digital camera combination might be made. The Leica 35mm f/2 lens, essentially unchanged since the late 1960s is famous among photojournalists. It’s hard to imagine it now, with cameras such a ubiquitous part of our daily lives, but the idea of a compact camera which you could carry around and take photos with is less than a century old. Add to that the demands of photojournalism and it is easy to see how a compact lens with (exceptionally) high-quality optics, paired with a rugged, compact camera body could be such a “big deal” in photography. I picked up this example for the equivalent of about 1000 USD. 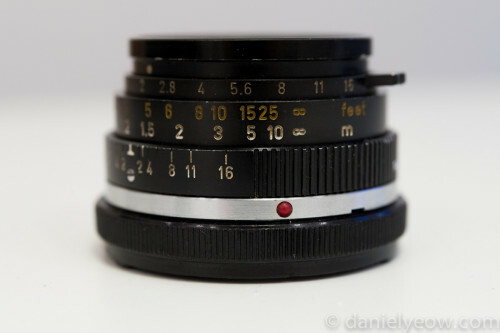 It’s used, and is a model from the early 1970s when Leica lenses were made in Canada. For some reason, these examples sell for less than their German-manufactured counterparts, even though every piece of evidence available indicates that the optical quality is the same (even the glass is sourced from the same place). As you can see from the first image (right up the top), the pairing of lens and camera body works well to produce a well-balanced and compact photography setup. 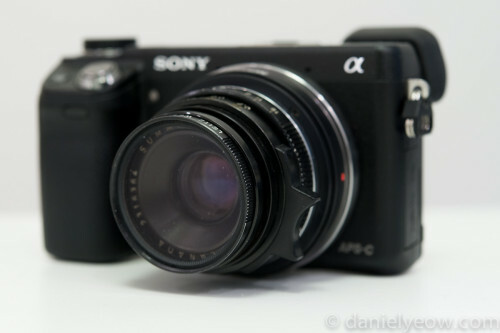 On an APS-C sensor a 35mm focal length lens will give you a field of view roughly equivalent to a 50mm lens on a full-frame camera which is considered a “standard” focal length. The bottom line however is that it works, and it works well. I can now easily slip this camera into a large jacket pocket, or side pocket in my backpack. It is light, and it takes excellent pictures. Because of its ease of use, I have begun to take it with me everywhere again, and I am taking more pictures as a result, and this can only be good news in terms of my development as a photographer. Perhaps someday, when I have obscene amounts of disposable income, I’ll buy myself a Leica camera body, but the Leica M currently retails for about 7000 USD (body only), and cool as it is, every photographer knows that the real reason to get a Leica is because of the lenses. The NEX-6 costs almost a tenth, at 750 USD, and frankly it serves my needs much better. This new setup has allowed me to continue taking photographs with the freedom of full manual control without the hassle of having to lug around a ton of photo gear. Yes, in many situations, that gear is necessary, but most of the time, it isn’t, and most of the time, I would still like to take photos since, as it is in many other things in life, it’s not just about the results, but it’s also about enjoying the process, and the bottom line is that I love photography.